Please update your browser to view this site correctly. Winter weather can often exacerbate eczema on sensitive skin. Dry and cold air can increase the dryness of skin, leading to the need to moisturize. The decision to moisturize is a good one, however, most lotions have acetyl alcohol in them. Alcohol is a drying ingredient and can create a vicious cycle once applied. According to a 2016 scientific publication in the American College of Allergy, Asthma and Immunology (ACAAI), researchers looked to answer the questions regarding bathing frequency and eczema care. The authors note, "daily bathing is fine, as long as it's followed by lots of moisturizer. In other words, soak and smear." However, what kind of moisturizer is best? And what else can you do to help manage itchy and dry skin? "Eczema is the same color as skin or lighter. If it is not red, then the skin is often not infected and doesn't require a separate course of management. However, if it is red, that skin is no longer protected, at which point a topical antibiotic ointment is needed, such as bacitracin--usually best tolerated. Bacitracin is an easily found OTC ointment. For preventative measures, look first to management choices such as creams, coconut oil (pending no parent has a nut allergy or there is no suspected nut allergy in the child), and of course, essential fats. If you are breastfeeding, a daily dose of 3,000 mg of fish oil is my suggestion. And, if your child is not breastfeeding, then at least 120 mg of DHA supplementation is needed. Emily also suggests looking into the triggers of eczema, such as imbalanced (too much) intake of: gluten, dairy, soy, eggs, and corn." 1) Skip the soap: Baths are a great way to decrease stress and relax for your child, but if they are prone to eczema, soap is really drying. Stick with warm water only and take baths as often as your child enjoys. 2) Choose creams that don't have alcohol as an ingredient: Aquafor or Cetaphil are great choices as well as Burt's Bees Baby ointment and Honest Company's organic healing balm. Coconut oil is the least processed and whole-food choice when it comes to choosing a moisturizer, pending your child is not sensitive or allergic to tree nuts. 3) Dehydration can also be a cause of dry skin: Winter time doesn't equate to great water intake because it's cold to drink. Think beyond water as a hydrating fluid. We love to include chamomile, mint, fennel, and even lavender tea as hydrating choices for your child. Bone broth is also a therapeutic, nutrient dense, and hydrating option. 4) Essential fats are co-factors for healthy skin: Daily fish oil intake, or at least 3-4 servings of cold water fish a week can lead to hydrated skin. Plant-based options such as walnuts, almonds, avocado, chia seeds, flaxseeds, and coconut are wonderful daily choices. 5) Rotating major food triggers can help resolve dry skin: We are all susceptible to over-consuming foods such as gluten, dairy, corn, and eggs as they are in so many of the foods we eat. 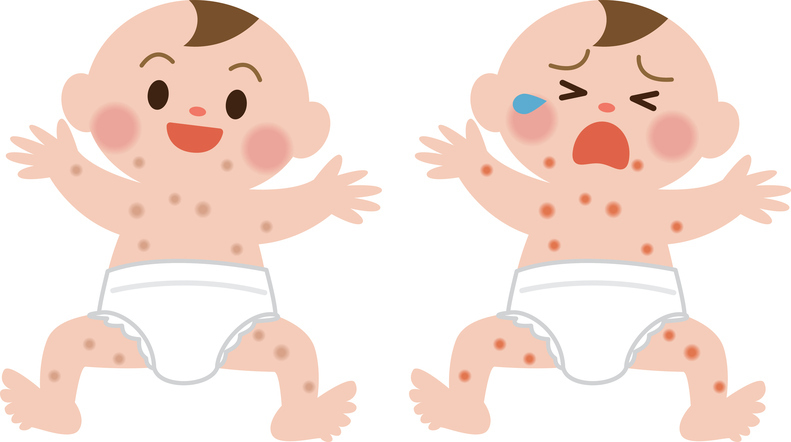 But, we also cannot ignore the role that they play in atopic dermatitis such as eczema. Rotating these foods (skip daily intake, include every 5-7 days) to see if their is improvement in skin health is important. A complete elimination of the perpetrators may be necessary. Eliminate problem foods for at least 21 days before reintroducing. Sign up for promos and product news. growbabyhealth.com offers genetic, health, wellness, lifestyle, and nutritional information and is provided for informational purposes only. Any information found on this website is not intended as a substitute for the advice provided by your primary healthcare provider. Do not rely on information found on the website as a substitute for, nor does it replace, professional medical advice, diagnosis, or treatment, Always speak with your primary healthcare provider before taking any medication or nutritional supplement or using any treatment for a health problem. If you have an existing or suspect a medical problem, contact your primary healthcare provider immediately. Do not disregard professional medical advice or delay in seeking professional advice because of something you have read on this web site. The use of any information provided on this web site is solely at your own risk. Nothing stated or posted on this web site or available through any services offered by GrowBaby, LLC or Dr. Leslie Stone, Dr. Michael Stone, Emily Rydbom CN, BCHN, CNP, or Lindsey Wilkens, RN are intended to be, and must not be taken to be, the practice of medicine. Information provided on this web site does not create a healthcare provider-patient relationship between you and any doctor or healthcare professional affiliated with our web site. Information and statements regarding dietary supplements have not been evaluated by the Food and Drug Administration and are not intended to diagnose, treat, cure, or prevent any disease.